Instructions: Card size: 5" X 5 1/2". Start by cutting folded ivory card with the Decorative Oval, leaving top 1/2" of die off the top of the fold. Cut another decorative Oval out of decorative paper and glue to front side of shaped card base. Cut Decorative medallion base layer out of magenta and one from Ivory. Cut the decorative Medallion from decorative paper (medium pink) and from ivory, this will be the "stand" for the card. To make the card sturdier I cut a piece of acetate and glued it to the back of the card over the oval. I also cut a piece of decorative paper to cover the back inside oval as well (both are glued to the back of the card). The paper can be seen from the front of the card so choose something pretty. Glue the "stands" on and make sure they are level so that the card sits properly. Stamp sentiment with Lilac Posies (a dark pink or magenta ink) on light pink decorative paper then die cut with an oval die. Die cut a dark pink oval for a mat and glue to sentiment then glue to the front of the card, centering. 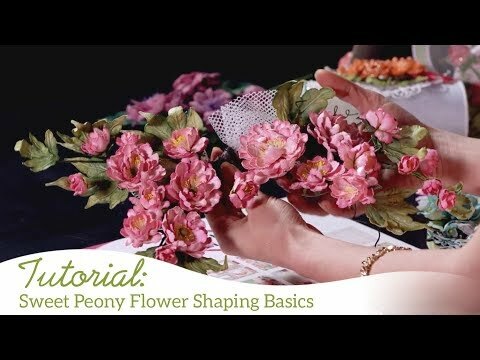 Now stamp and die cut Peony Bud and Bloom twice each then color. Cut out forward parts of the flower bloom and bud from second set and glue/foam tape to matching parts of base flower and bud to give it more 3D dimension. (Shape flower a bit from the back on a flower shaping pad with the large stylist) Glue some Prills to the very center where the stamped stamen are. Sponge glue onto bloom and bud and glitter with Crystal Clear. Decorate the card front with the bloom and bud, adding in a few leaves.